Video Nation is a down to earth handbook for improving the production quality of your videos, without breaking the bank. 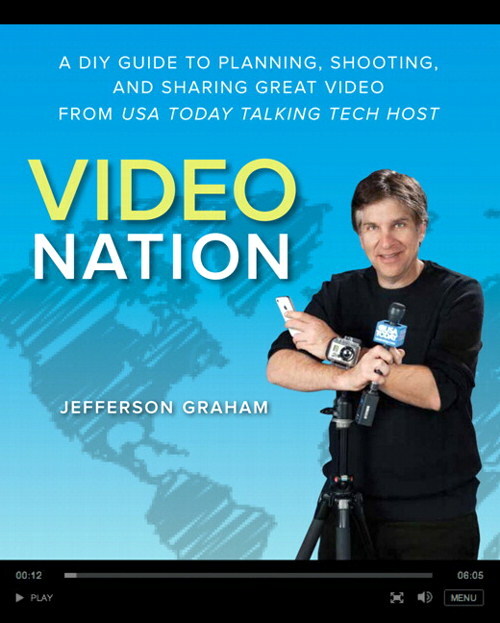 Author Jefferson Graham knows what he is talking about because he has over 300 productions under his belt as producer, director, videographer, and talent. Many times he is wearing all these hats just like you may be doing when you start. He’s been there and is very generous in sharing what he has learned, the hard way, so you don’t have to. Both the detailed table of contents and the index allow you to truly use this as a handbook, to pin point exactly the information you need to create better video (and audio). Jefferson starts with iPhones and Flip-type cameras and works up to Digital SLRs. You don’t have a viewable product until post production is complete. The author recommends configurations for Windows and Mac hardware and video editing software starting at $300, providing details on what you really need in order to do heavy duty editing. To get the most out of this book, read it through from cover to cover. Then as you are doing your preproduction planning, zero in on the topics needed. Do your part in increasing the quality of those YouTube, Facebook, and local Web site videos by picking up Video Nation and use these practical tips in your next video production. Remember you support MyMac.com when purchase this book through the MyMac Amazon link.